There has been considerable work undertaken by the Critical Care Nurse Education Review Forum, a sub-group of CC3N, to develop both Standards for Critical Care Nurse Education and a Competency Framework which underpins it. We are pleased to announce the publication of the Adult Critical Care Major Trauma competencies which are the product of working collaboratively with colleagues from the National Major Trauma Nursing Group (NMTNG) and CC3N supported by the National Major Trauma and Burns CRG. The mentor slides have been by created by CCNERF to try and provide the need to know information before you start mentoring staff using the Step competencies. Step 2 Competencies have been designed to further develop your essential critical care skills and will require enhanced theoretical knowledge to underpin your practice. 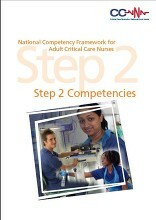 It is anticipated that Step 2 competencies will be undertaken whilst undertaking an academic critical care programme. ​Step 4 competencies have been designed to provide you with the core skills required to take charge in a critical care unit; building management and leadership capability into your professional development, to demonstrate safe and effective coordination and prioritisation of unit workload, workforce and resources. You are advised to keep a record of any supportive evidence and reflective practice to assist you during progress and assessment reviews and to inform your NMC revalidation. have been designed to further develop the expert core skills required to safely and professionally care for the critically ill patient without any direction.Step 3 competencies will also be used to underpin academic critical care programmes of study.